Growing up birthdays meant two things: presents and cake. Even as an adult, it's not my birthday until I have unwrapped something and eaten a piece of sugary goodness. 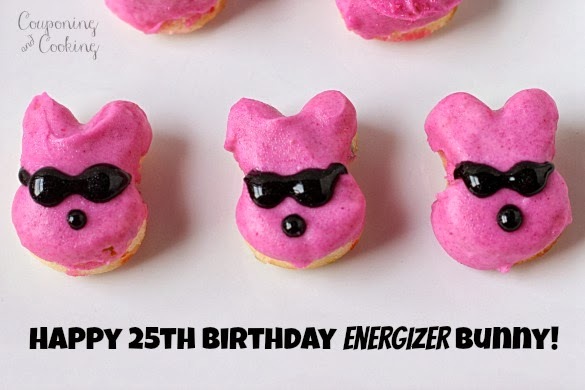 So it only makes sense that the Energizer Bunny would need cake and presents to celebrate his 25th birthday too. So what do you get a hot pink, drum banging, sunglasses wearing bunny? Don't worry! He is actually the one giving out presents. 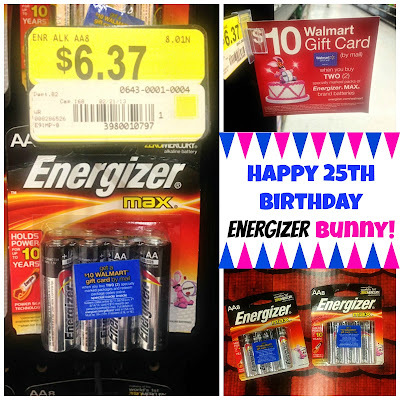 To celebrate his birthday, Energizer is running a promotion where whey you buy two packs of specially marked batteries at Walmart you can apply for a $10 Walmart Gift Card rebate. And if that wasn't enough of a deal, right now there are some great coupons that mean you can get a pack of select Energizer batteries for as low as .37 cents a pack after coupons and the gift card promotion. Final price for two packages: .74 cents or .37 cents per package! With the holidays coming up, I know that all of us could use some extra batteries around. Between holiday decorations, kitchen appliances (holidays = excessive baking), and presents, I have a feeling I will go through both packages and more. There are many different batteries included in the promo so depending on what you need you can adjust your purchases accordingly. If nothing else, you need to make sure that you have batteries on hand for all those gifts that say "batteries not included". There was nothing worse as a child then getting an awesome gift only to realize that you had to wait to play with it until your mom could run to the store and get batteries. So take advantage of this deal and avoid sad Christmas faces this year. Now that I have covered the Energizer Bunny's present, it's time for some cake. And what better way to celebrate 25 years then with these adorable Birthday Bunny Cake Bites. 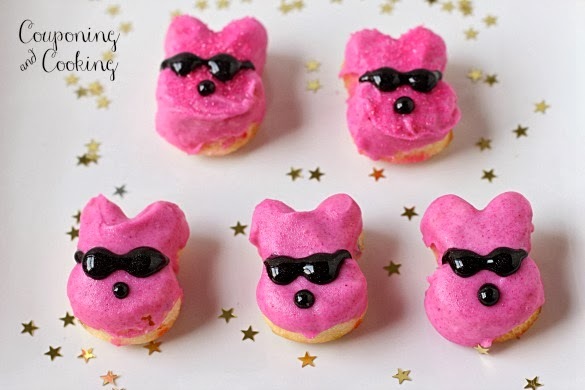 They are based off of my Homemade Peep Cakes I made this Easter. I followed the same directions except these got a little something extra with hot pink food coloring and sparkly sunglasses. Thanks to Energizer and Walmart, you can earn up to four $10 Walmart Gift Cards. I’ll be heading back for more batteries for sure in the next few weeks so I can do the deal at least one more time. I don't know about you but during this time of year we could definitely use those gift cards to put towards Christmas presents or food for our holiday parties and events. 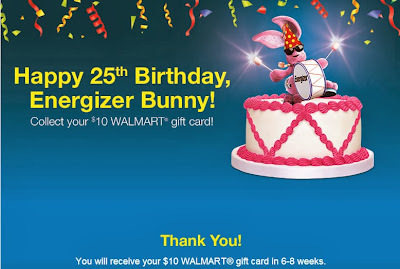 What will you use your $10 Walmart Gift Card from the Energizer Max rebate for?